The "Song of Human Revolution" was composed by President Ikeda in July 1976 amidst the heightened tensions faced by the Soka Gakkai while bracing the imminent onslaughts of the three powerful enemies. Since 1975, certain mass media in Japan began directing their vicious attack on Soka Gakkai due to their misunderstanding of and prejudice against President Ikeda’s effort for peace. Simultaneously, scheming to drive a wedge between mentor and disciple of Soka Gakkai, Nichiren Shoshu Priesthood hurled unfounded criticism and defamations at the Gakkai members. To battle against the devilish forces bearing their fangs at the Soka Gakkai, President Ikeda decided to compose the "Song of Human Revolution" at the end of June 1976. He aspired to create a song that instills undaunted courage and unyielding fighting spirit to the beloved members to overcome whatever adversity that may arise. It is ultimately by confronting these raging tempests in the journey of kosen-rufu can one activate the life-state of the Bodhisattvas of the Earth within oneself and achieve one’s human revolution. It will in turn lead to the establishment of human happiness on an individual basis and to the attainment of world peace on a grand scale. Hence, from the moment he resolved to compose a new song, President Ikeda had decided it to be titled "Song of Human Revolution", a song of life that would inspire all to build a new humanistic culture and humanism. By 16th July, he completed the lyrics of the song in his extremely busy schedule. The initial draft comprised 3 verses, each with 5 lines in length. The next morning he further revised the lyrics and after his hectic day, he started composing the melody in the evening. Shortly after 11pm, his mind had conceptualised the general outline of the melody. In the afternoon of 18th July, President Ikeda worked on the melody with a young music teacher, Mr Sugino Yasuhiko at the piano. The song was not completed in time for the Headquarter Leaders Meeting. When he read the lyrics of "Song of Human Revolution" to the audience in the meeting, it exploded into an endless roar of cheers and applause. As the song was intended to be a masterpiece for eternity, President Ikeda did not compromise in the least to rush it out. Right after the meeting, he assembled Sugino, 2 YWD members who are music graduates and the student division music committee representatives back to the main hall of level 3, Soka Culture Centre. He tried to write the melody while listening to the opinions of others but as time passed, it was still far from perfection. Realising that the 5 lines verse could be the main factor leading to the stalemate, he proposed it to be reduced to 4 lines verse and it was met with much delight and concordance from the team. But deciding on which line to omit was a great struggle as each word carried profound significance. After deep consideration, it was decided on the second line of every verse. However, every second line contained an important word "comrade" that carried deep significance and went in tandem with a play named Doshi no Hitobito (Comrades), set in the 17th century Japan where the Satsuma warriors betrayed their comrade’s trust by killing them to trade off their movement’s survival. Despite every sound reason they can use to justify their eventual success in revolution, the sellout of comrade tarnished the very ideals they claimed to uphold. Since President Makiguchi’s time, there have been members who, motivated by short-term self-interest, personal comfort, self-preservation or fear of persecution, betrayed their comrades and even their mentors. President Ikeda wished to use these phrases to call out to the members that under no circumstances they shall let these betrayers defeat them. Since the first line of each verse shares the same profound significance of "comrades", he proceeded to cut it to 4 lines verse. Prior to the recording of the song sung by members of the Fuji Student Chorus in the late afternoon, he changed the phrase "Pressing on through blizzards, we advance never fearing" to "…, we boldly advance". After dinner with overseas members, President Ikeda played the tape repeatedly and even invited leaders who were still present at the headquarters to voice their views. As they felt the rhythm in the middle was a little boring, he again invited Sugino and others over for further revision. Basing on the belief that peace and compassion begins with the courage to uphold the truth of Buddhism, the 1st verse, 3rd line "peace and compassion" was changed to "truth and courage"; the 3rd verse, 2nd line "sky" to “rainbow”. Following that, President Ikeda wanted to make the melody rise gradually in the 3rd line of each verse. As he tried humming it, Sugino revised the score and sang the new version while playing the piano. “All right, that’s it!” Finally the song was completed at 8.40pm on 18th July 1976. The new song, sung by the music teacher with piano accompaniment, was recorded on tape. The newly edited lyrics and melody were published on Seikyo Shimbun the following day. After 9pm, President Ikeda telephoned the executive leaders in various regions and prefectures, “I composed ‘Song of Human Revolution’. I made it to encourage everyone. It’s the heartfelt cry of my inner being. I’ll play it for you now.” He then placed the mouthpiece of the phone in front of the cassette player and played the tape. At first, he used one phone, but later he used three at a time. The next day, the song had its inaugural performance in Kansai. In composing "Song of Human Revolution", President Ikeda took the greatest pains trying to find a way to express and communicate President Toda’s profound spiritual awakening in prison of his identity as a Bodhisattva of the Earth. It was based upon this awakening that Toda rose up alone and dedicated his life to kosen-rufu. 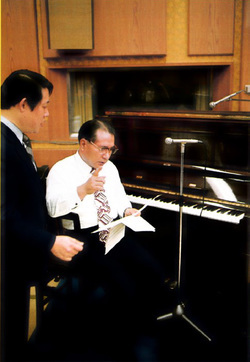 Such is the earnestness of President Ikeda in fine-tuning the song till the very last minute before it was finally released for recording. The masterpiece of "Song of Human Revolution" spread very quickly and soon members throughout Japan and even around the world were singing it.